This is the first of two posts that describe how two recent trends- falling energy prices and the global tightening of credit- are affecting the market for investments in clean energy. This post will examine falling energy prices, while the next post will examine tighter credit. Several recent articles in major publications (WSJ and NYT) have pointed to the negative affect that falling fossil fuel prices are having on alternative energy. As the graph to the left shows, crude prices have dropped significantly since their record highs earlier this summer. The NYT article mentions that natural gas prices have followed suit, dropping from $13.58 per thousand cubic feet in July to $6.79 in October. Coal has also dropped in price (EIA). 3) Compute an internal rate of return and decide if it meets some hurdle rate. If so, invest. If not, throw it out. Using this framework, tightening credit and falling energy prices are a double whammy for clean energy investments. First, tighter credit means that the "price" for capital goes up, i.e. interest rates and hurdle rates are set to rise. At the same time, lower energy prices mean the savings from avoided energy use are smaller, reducing the future income stream, thereby making investments less likely to meet the already higher hurdle rate. This exodus of capital makes sense using the project finance framework. But taking a step back, why should an investment in clean energy, a stable investment that will generally have a lifetime of at least 10 years, be compared to a short-term, highly volatile price signal like oil? The massive volatility of oil, natural gas and coal makes their price almost worthless in long term planning. Oil, after up being up about 40% on the year during the summer, has since swung to being down about 30% year-to-date. Making long-term, sober investment decisions based on a commodity subject to such whipsaw effects seems like no way to manage money. I believe this volatility in the savings stream is not only a serious problem with relying on traditional project finance to value investments in clean energy. Several potential fixes come to mind. First, and easiest, is policy. Enact what Thomas Friedman has been calling for the past year: a gas tax that puts a floor on the price of oil. This would ensure that clean energy investors need not worry about extreme downside risk of falling energy prices. Second, is to rethink the provision of energy. Currently, energy is provided as a commodity, something that everyone can buy and use freely. Instead, why couldn't power utilities - and their investors - rethink the model? Instead of selling energy by the killowatt-hour, why don't utilities start selling the service of power? This is a way to strip the volatility out of energy provision. Consumers could enter into fixed price long-term contracts with energy providers to ensure for the service of power regardless of the source, insulating themselves from energy price risk. Providers, on the other hand, would be able to enter into long-term agreements and know they have a market for their power at a specific price. They could then use this price for energy to investigate whether investment in clean energies is attractive or not, and strip fossil fuels out of the equation. Third, is to use scenario planning to imagine what will happen to a clean energy investment under different future energy scenarios. In this paragraph, I essentially adapt Nassim Taleb's Black Swan framework to energy prices. From a clean energy investors perspective, in the worst case scenario the price of oil will go to zero, and the investment's income stream will go away. However, I believe this is extremely unlikely as oil R&D and exploration has been going on for centuries, making the possibility of a disruptive game-changer slim. On the other hand, let's assume we didn't make the investment in clean energy, but instead invested in fossil fuels, because it had a better internal rate of return based on our projections. Then, strife in the Middle East, a hurricane in the Gulf Coast, strict new carbon taxes or one of a handful of other plausible scenarios occur, and drives the price of oil through the roof. 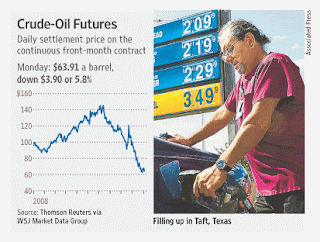 In this case, the price of oil can rise indefinitely. It can easily pass the highs it set earlier this summer and head above $200 and theoretically just keep on rising. It seems clear to me, then, that the much bigger risk is that oil prices go through the roof, not that they collapse. From a risk management perspective, going the clean route is clearly the best choice. Although the recent drop fossil fuel prices has hurt investment in clean energy, I think going forward fossil fuel volatility will actually become one of the key drivers for further investment. Yet again, it looks like clean tech has the potential to help the world turn a serious problem into an opportunity for a greener, more prosperous future.